Dalgarno is the place you reach when you reach North Pole and keep going. It is also a safe Labour ward in the Conservative citadel of the Royal Borough of Kensington & Chelsea. If you can understand what on earth has been happening in British politics lately, these two apparent paradoxes should be easy to resolve. Bear with me as we explore the polar north of Central London. Dalgarno is a far cry from what one is used to thinking of as Kensington, but it is just as much a part of that neighbourhood as the palaces and expensive boutiques to be found further south. Kensington has always had its own north-south divide, and although the frontier has shifted around a bit over the years in Notting Hill, there is a large community north of it, of which Dalgarno is the northernmost. The ward lies between the north end of Ladbroke Grove to the east and the London Overground line between Willesden Junction and Shepherds Bush to the west. To the south, there is a jagged line starting at North Pole Road – my sense of symmetry was pleased that there is a Kensington Avenue at North Pole, Alaska. The main through road is Barlby Road. The northern edge of Dalgarno ward runs along Harrow Road, but the area to the north of the Great Western railway line is made up almost entirely of the great necropolis of Kensal Green Cemetery. To the passer-by on a train, it is the area around the squat tower of the St Charles hospital, the Kensal gasholders and the big Sainsbury’s. The Ladbroke Grove train crash happened on this stretch in 1999. Dalgarno ward is dominated by social housing, the tenure of 65 per cent of its residents. It is not a “council estate” ward as such because North Kensington has always been a laboratory for different models of social housing. The largest single element is the Peabody Trust’s Dalgarno Estate, based around a densely populated group of 1930s slab blocks, but there are parts of the ward that are quite suburban-looking as well. The population is extremely diverse: 41 per cent “white British” in the 2011 Census with a wide range of other ethnicities also represented. Some of the minority population is of recent origin, but the ward is also part of one of London’s oldest black Caribbean communities. The demographics point towards this being a safe Labour ward and it has indeed produced large Labour majorities since it was created by local boundary changes in 2014. 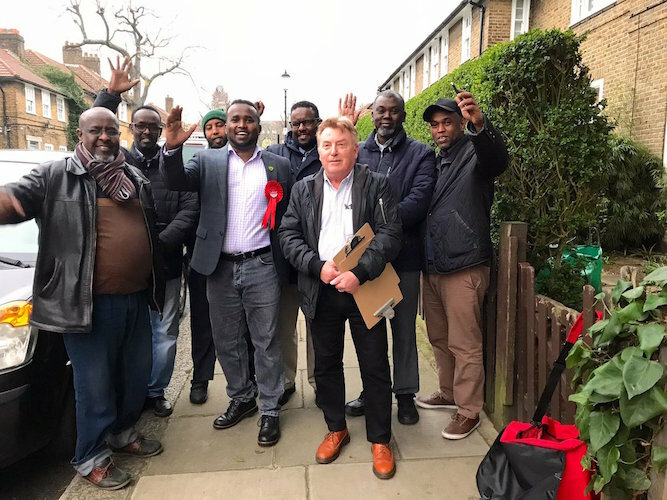 The party’s biggest win there came in 2018, when full borough elections took place in the wake of the Grenfell Tower disaster. Grenfell is in a different ward to the south of Dalgarno, but it is nearby. Some more excitable Labour supporters persuaded themselves that the party could win control of the borough last year, but this was never realistic. Despite a significant pro-Labour swing, only one seat changed hands – in St Helen’s ward, which borders Dalgarno. One of the Labour councillors elected in Dalgarno, Robert Thompson, is a vicar who has moved to take over a parish in West Hampstead and therefore stepped down as a councillor. Yesterday’s by-election – Thursday 21 March – was held to fill the resulting vacancy. Labour’s Kasim Ali won the seat with 719 votes. He is a charity project manager and an energetic fundraiser for the victims of Grenfell, who has run six marathons for that cause. His victory means that Labour, as is often the case, have a solid lock on the representation of North Kensington but remain a localised permanent opposition on a Conservative-controlled council. Tory candidate and long-time party activist Samia Bentayeb achieved a creditable 306 votes in coming second. Liberal Democrat, Green and UKIP candidates also stood. Although Labour won, it was not a very encouraging result for the party. Its vote share was down significantly, from 71 per cent last year to 52 per cent, with gains scattered between all the other parties. To some extent this outcome was just a reversion back to the normal state of affairs following the 2018 peak, as the Labour vote share has tended to be in the 50-60 per cent range. But it was at the lower end of that range. Turnout fell from 38 per cent in 2018 to 29 per cent – not great but not terrible either. The worry for Labour is not that it might lose Dalgarno ward in the future, but the implications for its defence of the parliamentary seat of Kensington, which Dalgarno forms part of. Labour famously won Kensington in 2017 with a 20-vote majority. To hold on to it, Labour really needs to win by big margins in wards like Dalgarno in the north of the constituency to outweigh the Tory votes that will pile up in the south of it. It isn’t possible to compare numerical margins in multi-member ward elections precisely, but Labour’s lead in Dalgarno shrank from around 800 in 2018 to a little bit over 400 in 2019. A split vote and a low turnout were not what Kensington Labour was looking for, even if they have maintained their level of representation in the council chamber.